Here’s one thing the iPhone can’t do: spin vinyl. And while that mobile phone looks like Apple Inc.’s most interesting iPod to date, it will suffer from an ailment that plagues every digital music player - uninspiring sound. So, in one of the more interesting comebacks in today’s world of compressed music files and fingernail-size speakers jammed into your ears, the format of choice during the Reagan administration has become popular again, to a point, for a simple reason: vinyl sounds better. More specifically, vinyl represents a listening experience. You sit on an easy chair or a comfy couch between two speakers the size of moving boxes, drop the needle on the record and just listen. While listening, you admire the original artwork on the cover, follow along with lyrics printed on the album’s sleeve or laugh at the big hair in the compilation of concert pictures decorating the inside gatefold. That’s why millions of people, myself included, became music fans. Then I got a job, a multidisc CD player and never again thought of getting up every 20 minutes to flip an album over. Today, I could drive from Hollywood, Fla., to Homer, Alaska, listening to my iPod and never hear the same song twice. Yet that iPod, despite the wonderfully convenient storage that holds a lifetime of shifting musical tastes, has never sounded as rich as the music of my youth. And it never will because in order to fit 20,000 songs on a device smaller than a cigarette pack, compromises were made. Notably, the song files are severely compressed. Try this test and you will hear what I’m saying: Play a favorite CD on any player - a home system, a portable CD player, your car - the n play the same music on an iPod amplified through the same speakers. The iPod will sound like AM radio by comparison. Yes, Apple’s iTunes store now sells some songs at a higher quality, for more money, and you could always load music from a CD onto an iPod at a higher bit rate - bigger file, better quality. Some people do this, but it minimizes the iPod’s greatest attribute, storage. Also, I do believe higher-quality headphones make a difference. Ever since the advent of the compact disc, audiophiles have said vinyl records, with their analog technology, provide warmer, more fulfilling sound. Frankly, to my ear, there wasn’t a big enough difference in sound quality to abandon the convenience of the CD. Now the iPod has made the debate - sound quality versus convenience - moot. More than 100 million iPod-toting people clearly prefer convenience. But there’s a base of consumers besides collectors who want vinyl, and, refreshingly, it’s largely today’s young adults. The same people supposedly at the forefront of the digital revolution now seek the same listening experience their parents once enjoyed. (Heck, many of these kids were probably conceived with the turntable spinning, which may explain things.) Unfortunately, industry sales numbers show that shipments of vinyl sales, like CD shipments, are falling, but that hasn’t stopped record labels from encouraging young fans to take an interest in better sound and interesting packaging. There’s even a new technology for vinyl, called 180 gram, that is thicker than old records and, according to aficionados, firmly keeps the needle in the grooves and thus improves sound. Another twist: Vinyl is not cheap. The White Stripes’ new album, “Icky Thump,” sells for $15 in CD form and $30 in vinyl. There are two reasons for the higher prices. One, record labels promote vinyl as a collectible, and, two, the new releases and key reissues are often pressed on the thicker vinyl. My favorite irony and a testament to how ethereal digital music files actually are is that if you buy a new release on vinyl, record labels give you a coupon to download a digital copy of the album for free, thus solving the vexing problem - doable but not convenient - of transferring the music into a digital format for your iPod. “We don’t offer every new release on vinyl, not by a long shot, but we’ve had more vinyl releases in the last two years” than in recent memory, said Martin Hall, a publicist for Merge Records. And when they do put an album on vinyl, the pressing is not huge, maybe 1,500 copies, depending on the band. If you miss the days of sitting around and listening to music - or maybe you’ve never tried it without headphones stuck in your ears - give it a spin. Interesting vinyl can be found at any garage sale or from an independent music retailer. Heck, you can buy a new turntable, good speakers and a receiver (your basic home stereo setup) for less than an iPhone. You should hear what you’ve been missing. 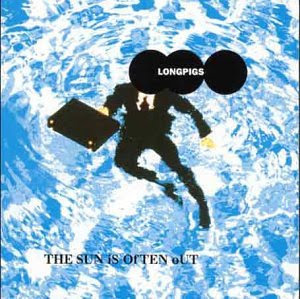 Underappreciated Edition: Five from the Longpigs' "The Sun is Often Out"